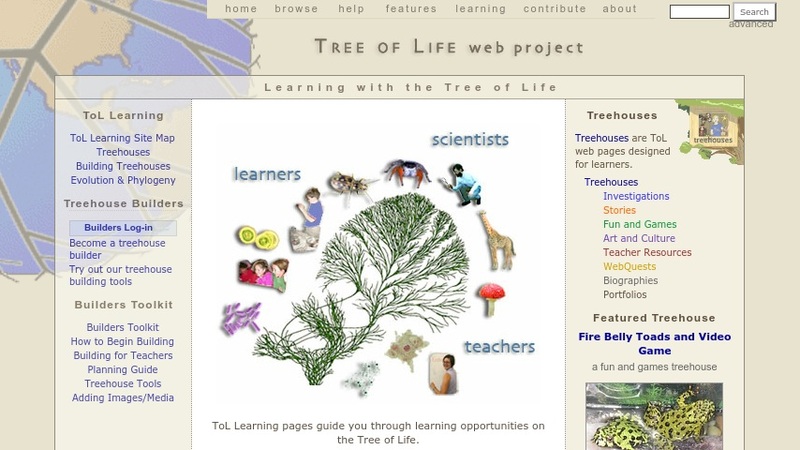 The Tree of Life Web Project is a collection of information about biodiversity compiled collaboratively by professional scientists, teachers, students, and amateur enthusiasts. Its goal is to provide a webpage with pictures, text, and other information for every species and for each group of organisms, living or extinct. Connections between Tree of Life web pages follow phylogenetic branching patterns between groups of organisms, so visitors can browse the hierarchy of life and learn about phylogeny and evolution as well as the characteristics of individual groups. Its content consists of scientific materials (pages for individual species or subspecies and for supraspecific taxa) contributed by professionals; learning materials, or "treehouses" (investigations, stories, teacher resources, webquests, and other items); and media (images, videos, audio files, presentations, animations, downloadable documents, and other items) contributed by teachers, students, and science enthusiasts. Site materials include information about the project, its developers and contributors; information on how to build treehouses; a featured treehouse; and links to various treehouses, organized by type.